Anne, Princess Royal and Princess of Orange (1709-1759), Daughter of King George II; wife of William Charles Henry Friso, Prince of Orange. Sitter associated with 24 portraits. Princess Caroline Elizabeth (1713-1757), Third daughter of George II. Sitter associated with 14 portraits. Frederick Lewis, Prince of Wales (1707-1751), Son of George II; father of George III. Sitter associated with 35 portraits. Philip Mercier (1691-1760), Portrait painter. Artist associated with 26 portraits, Sitter in 3 portraits. 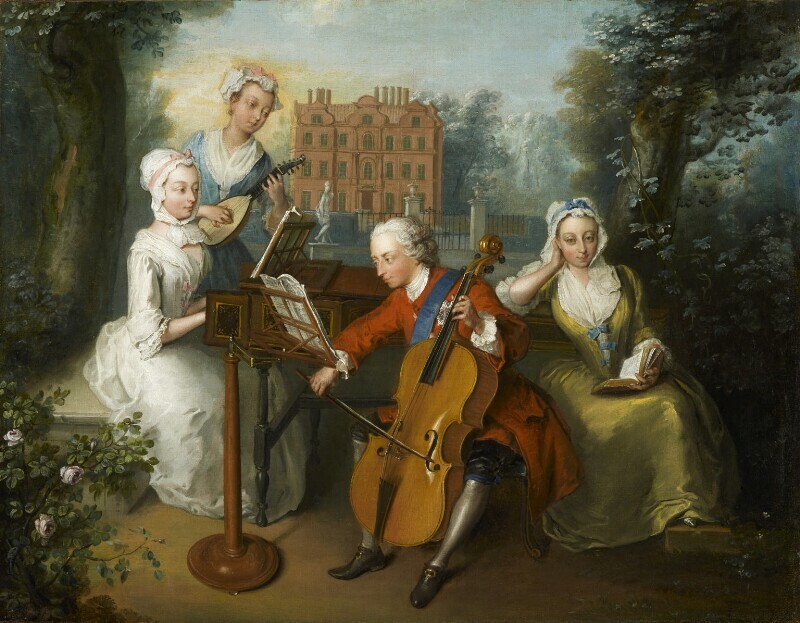 The 26-year-old Prince is shown playing the cello with three of his younger sisters, from left to right, Anne, Princess Royal (age 24), Princess Caroline (age 20) plucking a mandora, and Princess Amelia (age 22) reading from Milton. In the background is the Dutch House at Kew where Anne lived before her marriage in 1734 to Prince William of Orange. Mercer was principal painter to the Prince of Wales and drawing master to the Princesses. Prime Minister Robert Walpole narrowly escapes defeat in the House of Lords over the investigation into the South Sea affair. His Excise scheme, introduced the previous year, also provokes widespread resistance among merchants and is withdrawn. Sugar and Molasses Act is passed by Parliament to tax British colonists in North America. John Kay, working in the Lancashire woollen industry, patents the flying shuttle to speed up weaving. Poet Alexander Pope publishes his philosophical Essay on Man, which proposes a system of ethics in poetic form. Clergyman Stephen Hales publishes the second volume of his Statical Essays, Haemastaticks, describing the measurement of the 'force of the blood', later known as blood pressure. Philip V of Spain and Louis XV of France sign the Treaty of Escurial and form an alliance against Britain. Voltaire publishes Letters on the English Nation comparing France unfavourably with England. British colonist James Oglethorpe founds Savannah, Georgia.